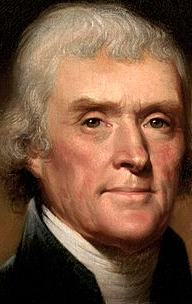 On December 28 1812, Thomas Jefferson from Monticello, writes to John Adams. Dear Sir,—An absence of five or six weeks, on a journey I take three or four times a year, must apologize for my late acknowledgment of your favor of October 12th. After getting through the mass of business which generally accumulates during my absence, my first attention has been bestowed on the subject of your letter. I turned to the passages you refer to in Hutchinson and Winthrop, and with the aid of their dates, I examined our historians to see if Wollaston’s migration to this State was noticed by them. It happens, unluckily, that Smith and Stith, who alone of them go into minute facts, bring their histories, the former only to 1623, and the latter to 1624. Wollaston’s arrival in Massachusetts was in 1625, and his removal to this State was "sometime" after. Beverly & Keith,who came lower down, are nearly superficial, giving nothing but those general facts which every one knew as well as themselves. If our public records of that date were not among those destroyed by the British on their invasion of this State, they may possibly have noticed Wollaston. What I possessed in this way have been given out to two gentlemen, the one engaged in writing our history, the other in collecting our ancient laws; so that none of these resources are at present accessible to me. Recollecting that Nathaniel Morton, in his New England memorial, gives with minuteness the early annals of the colony of New Plymouth, and occasionally interweaves the occurrences of that on Massachusetts Bay, I recurred to him, and under the year 1628, I find he notices both Wollaston and Thomas Morton, and gives with respect to both, some details which are not in Hutchinson or Winthrop. As you do not refer to him, and so possibly may not have his book, I will transcribe from it the entire passage, which will prove at least my desire to gratify your curiosity as far as the materials within my power will enable me. Extract from Nathaniel Morton’s New England’s Memorial, pp. 93 to 99, Anno 1628. "After this they fell to great licentiousness of life, in all prophaneness, and the said Morton became lord of misrule, and maintained (as it were) a school of Atheism,and after they had got some goods into their hands, and got much by trading with the Indians, they spent it as vainly, in quaffing and drinking both wine and strong liquors in great excess, (as some have reported,) ten pounds worth in a morning, setting up a May pole, drinking and dancing about like so many fairies, or furies rather, yea and worse practices, as if they had anew revived and celebrated the feast of the Roman goddess Flora, or the beastly practices of the mad Bacchanalians. The said Morton likewise to show his poetry, composed sundry rythmes and verses, some tending to licentiousness, and others to the detraction and scandal of some persons’ names, which he affixed to his idle or idol May-pole ; they changed also the name of their place, and instead of calling it Mount Wollaston, they called it the Merry Mount, as if this jollity would have lasted always. But this continued not long, for shortly after that worthy gentleman Mr.John Antacid, who brought over a patent under the broad seal of England for the government of the Massachusetts, visiting those parts, caused that Maypole to be cut down, and rebuked them for their prophaneness, and admonished them tolook to it that they walked better ; so the name was again changed and called Mount Dagon." " Now to maintain this riotous prodigality and profuse expense, the said Morton thinking himself lawless, and hearing what gain the fishermen made of trading of pieces,powder, and shot, he as head of this consortship, began the practice of the same in these parts ; and first he taught the Indians how to use them, to charge and discharge ’em, and what proportion of powder to give the piece, according to the size of bigness of the same, and what shot to use for fowl, and what for deer; and having instructed them, he employed some of them to hunt and fowl for him; so as they became somewhat more active in that imployment than any of the English, by reason of their swiftness of foot, and nimbleness of body, being alsoquick-sighted, and by continual exercise, well knowing the haunt of all sorts of game ; so as when they saw the execution that a piece would do, and the benefit that might come by the same,they became very eager after them, and would not stick to give any price they could attain to for them; accounting their bows and arrows but baubles in comparison of them.
" And here we may take occasion to bewail the mischief which came by this wicked man, and others like unto him; in that notwithstanding laws for the restraint of selling ammunition to the natives,that so far base covetousness prevailed, and doth still prevail, as that the Salvages became amply furnished with guns, powder, shot, rapiers, pistols, and also well skilled in repairing of defective arms : yea some have not spared to tell them how gun powder is made, and all the materials in it, and they are to be had in their own land; and would (no doubt, in case they could attain to the making of Saltpeter) teach them to make powder, and what mischief may fall out unto the English in these parts thereby, let this pestilent fellow Morton (aforenamed) bear a great part of the blame and guilt of it to future generations. But lest I should hold the reader too long in relation to the particulars of his vile actings ; when as the English that then lived up and down about the Massachusetts, and in other places, perceiving the sad consequences of his trading, so as the Indians became furnished with the English arms and ammunition, and expert in the improving of them, and fearing that they should at one time or another get a blow thereby; and also taking notice, that if he were let alone in his way, they should keep no servants for him, because he would entertain any, how vile soever, sundry of the chief of the straggling plantations met together, and agreed by mutual consent to send to Plimouth, who were then of more strength to join with them, to suppress this mischief; who considering the particulars proposed to them to join together to take some speedy course to prevent (if it might be)the evil that was accruing towards them; and resolved first to admonish him of his wickedness respecting the premises laying before him the injury he did to their common safety, and that his acting considering the same was against the King’s proclamation; but he insolently persisted on in his way,and said the King was dead, and his displeasure with him, and threatened them that if they come to molest him, they should look to themselves; so that they saw that there was no way but to take him by force; so they resolved to proceed in such a way, and obtained of the Governor of Plimouth to send Capt.Standish and some other aid with him, to take the said Morton by force, the which accordingly was done; but they found him to stand stiffly on his defence, having made fast his doors, armed his consorts, set powder and shot ready upon the table; scoffed and scorned at them he and his complices being filled with strong drink, were desperate in their way; but he himself coming out of doors to make a shot at Capt. Standish, he stepping to him put by his piece and took him, and so little hurt was done ; and so he was brought prisoner to Plimouth, and continued in durance till an opportunity of sending him for England, which was done at their common charge and letters also with him, to the honorable council for New England,and returned again into the country in some short time, with less punishment than his demerits deserved (as was apprehended). The year following he was again apprehended,and sent for England, where he lay a considerable time in Exeter gaol; for besides his miscarriage here in New England, he was suspected to have murdered a man that had ventured monies with him when he came first into New England;and a warrant was sent over from the Lord Chief Justice to apprehend him, by virtue whereof, he was by the Governor of Massachusetts sent into England, andfor other of his misdemeanors amongst them in that government, they demolished his house, that it might no longer be a roost for such unclean birds. Notwithstanding he got free in England again,and wrote an infamous and scurrilous book against many godly and chief men of the country, full of lies and slanders, and full fraught with prophane calumnies against their names and persons, and the way of God. But to the intent I may not trouble the reader any more with mentioning of him in this history ; in fine, sundry years after he came again into the country, and was imprisoned at Boston for the aforesaid book and other things but denied sundry things therein, affirming his book was adulterated. And soon after being grown old in wickedness,at last ended his life at Piscataqua. But I fear I have held the reader too long about so unworthy a person,but hope it may be useful to take notice how wickedness was beginning, and would have further proceeded, had it not been prevented timely." So far Nathaniel Morton. The copy you have of Thomas Morton’s New English Canaan, printed in 1637 by Stam of Amsterdam, was a second edition of that "infamous and scurrilous book against the godly." The first had been printed in 1632, by Charles Green, in a quarto of 188 pages, and is the one alluded to by N.Morton. Both of them made a part of the American library given by White Kennett in 1713 to the Society for the propagation of the Gospel in foreign parts. This society being a chartered one, still, as I believe, existing, and probably their library also, I suppose that these and the other books of that immense collection, the catalogue of which occupies 275 pages quarto, are still to be found with them. If any research I can hereafter make should ever bring to my knowledge anything more of Wollaston, I shall not fail to communicate it to you. Ever and affectionately yours.